In 2010, Knauf Insulation had set ambitious targets for 2020 to dramatically reduce CO2 emissions and energy use by 20%, cut waste to landfill to zero, lower Lost Time Accidents (LTAs) by 50% and reduce water discharge by 50%. In 2015, half-way through the challenge, the company was able to cut energy use by 17.5%, CO2 emissions by 16.4%; waste to landfill by 58%; and LTAs by 5% compared to 2010. Very significantly, Knauf Insulation also achieved their target of cutting water discharge by 50% in 2015, a full five years ahead of the deadline. Vincent Briard, Head of Sustainability, Products & Buildings at Knauf Insulation observes that their half-way point achievements in 2015 are a tribute to the hard work and innovation of everyone at the company. He explains that everyone today understands the significance of sustainability, and is aware of the importance of energy efficiency, waste reduction and lowering the number of lost time accidents. Interestingly, the 2015 results also include the 17 North American sites acquired by Knauf Insulation in 2014. The new report showcases many of the initiatives that have been introduced throughout the company and puts the spotlight on those plants that have achieved major breakthroughs in areas such as energy management, waste reduction or water discharge. The report also reveals how new investments and initiatives are making a difference. 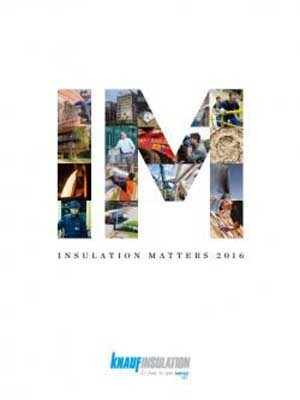 The report highlights how Knauf Insulation is playing their part in continuously campaigning to keep energy efficiency, sustainability and building safety at the heart of the political debate across the world. Additionally, the company’s pioneering work in green building has been detailed in the report including helping customers get more from Green Building Rating Systems, examining the criteria that should shape green building trends of the future, and discussing how Knauf Insulation solutions can contribute to indoor air quality, acoustics and thermal comfort. Products such as Mineral Plus and the revolutionary ECOSE Technology in Glass Mineral Wool as well as the Rock HVAC solutions are discussed in detail with customers providing valuable feedback. The report also unveils a unique research programme being conducted by Knauf Insulation across 21 occupied homes in Belgium on the real-life benefits of insulation by independently monitoring performance before and after renovation.